PETROPAVLOVSK-KAMCHATSKY, May 6 (Itar-Tass) -Observers in Kamchatka have registered intensification of the activity of the Plosky Tolbachik volcano, the Kamchatka volcano observatory reported on Monday, referring to data of the scientists that work at the Tolud base in the immediate vicinity of the eruption site. The activity intensification was recorded on May 4 “in the lateral outbreak crater,” the observatory specified. Lava is gushing there, ejected to a height of 100 metres. According to the Kamchatka branch of the Geophysical Service of the Russian Academy of Sciences (RAS), high seismic activity is registered on the volcano - the giant mount with a height exceeding 3.85 thousand metres above sea level, is vibrating with an amplitude of 3.25 microns per second. 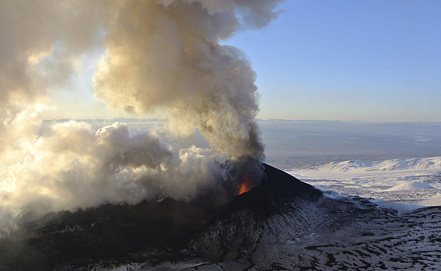 The eruption of the Plosky Tolbachik volcano continues for the sixth consecutive month. In the early days of the eruption lava flows from Plosky Toblachik destroyed two bases of the Institute of Volcanology and Seismology that were located in the Tolbachink dale. Plosky Tolbachik awakened on November 27, last year, after being dormant for 36 years from the moment of its great fissure eruption that was observed in 1975-1976. In Tolbachik dale, south of Plosky Tolbachik at an altitude of about 1.7 kilometres above sea level, a fissure zone with two active centres formed. The lava has been pouring from there. The Plosky Tolbachik eruption was assessed by scientists as outstanding. A lava lake has formed in the active zone. The lava flows have destroyed a station of the Institute of Volcanology and Seismology in the area of the Vodopadny creek, the Leningradskaya research base and a base of the Volcanoes of Kamchatka natural park. Trees were burning near the lava fields. The erupting volcano in Russia's Far East has become a sightseeing hotspot for crowds of thrill-seeking tourists eager to see flows of lava and clouds of ash. The height of Plosky Tolbachik is 3 thousand 85 metres above sea level. It is located in the south-western sector of the Klyuchevskaya group of volcanoes in Kamchatka in the east 343 kilometres from Petropavlovsk-Kamchatsky. The volcano poses no threat to nearby populated localities. Emergencies Ministry officers have been on duty in the volcano area whose task is to ensure safety of people going to the foot of the giant mount. There are five populated localities at distances from 50 km to 68 km from the foot of the volcano - the settlements of Klyuchi, Maiskoye, Kozyrevsk, Lazo and Atlasovo with the total population of more than 8.1 thousand. The volcano poses no threat to nearby populated localities, it is under continuous monitoring.